This volunteer-run heritage and information centre is sited on the northern edge of Coedgwilym Park, alongside the Swansea Canal. The centre, opened in 2011, contains a timeline of the village and its environs from 1794 – when construction began on the canal – to the present day. Also inside you can view DVDs and other material about various periods in Clydach’s history. The building previously housed the Swansea Canal Museum. The canal features prominently in the information available in the centre, since it was the catalyst for the Swansea Valley’s industrial development before the advent of railways. The stretch of the canal past Coedgwilym Park remained rural until the early 20th century. 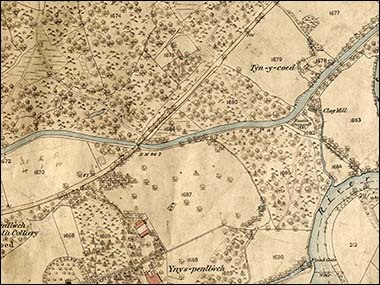 The extract of an 1876 map, shown here by kind permission of the West Glamorgan Archive Service, shows the bridge that carries Pontardawe Road over the canal. The road is flanked by trees, fields and marsh – and very few buildings! Today Coedgwilym Park occupies most of the field just below the centre of the map extract. It opened as a park in the week of Queen Elizabeth II’s coronation in 1953. Before that it was used by a local butcher to raise cattle for his business. The map notes the “Towing Path” alongside the canal, built for the horses which hauled barges along the water. The towpath is now part of Route 43 of the National Cycle Network, which allows cyclists and walkers to follow a largely traffic-free route from here to Swansea or up the valley to Ystalyfera. The heritage centre is typically open on weekends. For details, follow the link below to the Facebook page.